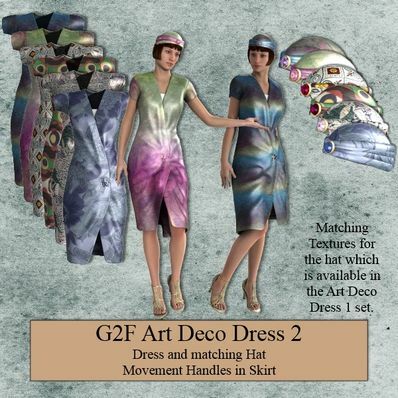 Art Deco Dress and matching Hat for Genesis 2 Female for use in Daz Studio 4.6. Textures for Hat require the Hat from Art Deco Dress 1. Hat not included. I love the colors! Thank you so much for sharing. Very elegant and authentic, but also really timeless. Thank you very much! Beautiful textures for this style. Thank you. Nice Dress with beautiful textures! Thank you so much! Very nice style and the hat is great! Elegance and beauty! Thank you!